Its amazing to me that I have not slipped up once in any of these things. Well, the caffeine has been challenging and is sort of still in the experimental phases. Right now I am drinking green tea instead of coffee at work! And now…number 4, it’s going to be a tough one! Now obviously its not going to be hard for me to go an entire week without weighing myself, the real challenge is going to be extending it beyond that week. My weigh fluctuates in a 7 lb range (147-154) up and down and I’m always wearing the same clothes, so I don’t think going up and down a pound or two here and there is something to really monitor even on a weekly basis. If a problem arises, it will become obvious to me by how I’m feeling, my clothes getting tighter, etc. We all know how discouraging the scale can be. So, when I get home today, the dumb thing is going in the closet!! I don’t even want the temptation to step on it right there in my face. Its true that I would like to eventually lose a few more pounds (tone up if you will) but I would rather judge that based on how I feel, how my clothes fit and just by observing myself. Not by that number. p.s. Hangry Pants is having an Element Bar giveaway, go check it out! 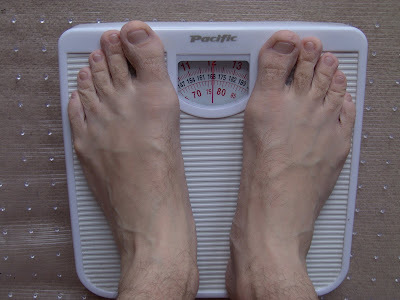 Posted on May 26, 2009, in Weight and tagged giveaways, weekly challenge, weighing. Bookmark the permalink. 18 Comments. Good luck!! I don’t even own a scale – why bother?! I just found your blog and I think your challenges are inspiring. I’m on the no-weigh bandwagon too, for about a month now. I let myself check in 1x per month, but mostly just go by how my clothes fit (I’m in your weight range too). good luck!!! scales are lame and unreliable anyways. I moved after Christmas and left my scale behind! I’ve weighed myself maybe 3 times since then only when I go home to my parents’ house and it’s wonderful!!!! Good luck! I think this is an awesome challenge! You’ve done so great, Sarah! Good luck with this one! Hope you had a great holiday weekend! Thanks for stopping by my blog. I love your weekly challenges. I can understand the difficulty of no/less coffee. I am on day two of no caffeine. Props to not weighing yourself! I used to weigh myself everyday, but I honestly don’t really care anymore. I’m not going to be judged by a number on the scale. Go by how your clothes fit and how you feel!